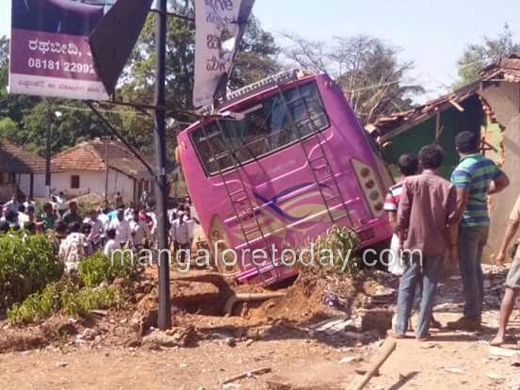 Karkala, March 1, 2017 : Passengers of a private bus which was on way to Shivamogga from Udupi had a miraculous escape when the bus veered off the road and rammed against a shop near Agumbe Guddekerri in Tirthahalli on February 28, Tuesday after the driver suffered a heart attack. The driver of the bus Srikanta (55) who hails from Tirthahalli has succumbed to heart attack. However the passengers escaped with minor injuries. Even the bus was badly mangled due to the impact of the collision. A motor bike too was damaged in the process while many goods in the shop were also destroyed. Sources said the driver had complained about chest pain earlier while having lunch at an Agumbe hotel. He might have later suffered a massive cardiac arrest while driving. Luckily the accident wasn’t major one as anything was possible in the case . But sorry for the driver . Sorry for the family of the bus driver. Even in the rarest never imagine of such . may his eternal soul rest in peace. How sad ? May lord give strength ad courage to the family. A sad incident. These days the cardiac arrest is increasing it is due to depression , stres and hypertension and so on.